I want to apologize for not blogging the last week or so. I've been so busy finalizing our move and getting things situated here. There's still a lot of unpacking to do but I've found some time to finally blog. As some of you may know, Daryl and I were married in the Oquirrh Mountain Temple last December and temples are very sacred and special to us. We made very special promises to each other when we got sealed and it's so nice to have little reminders around our home. We haven't completely unpacked so I haven't found a place to hang this beautiful picture of the St. George Temple we received from LDS Decor last week; so this picture from their website will have to do. I was really impressed with how quickly the picture arrived and how well packaged it was. 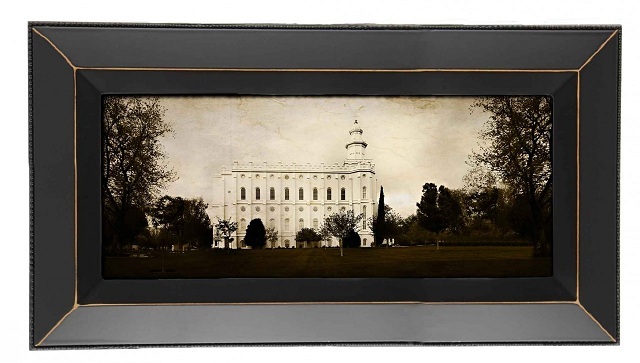 LDS Decor has affordable prices for inspirational art and decor items for those of the LDS faith. If you "like" LDS Decor on facebook you will automatically save 10% off your purchase and they ship free to the US and Canada, awesome right? Jenny from Modern Modest Beauty! Congratulations Jenny I'm so happy for you. You should be getting an email from me shortly with what I will be needing from you. I want to thank everyone else who entered and wanted to give a little heads up that there is another great giveaway lined up for Thursday so look out for it! I love all the beautiful pictures that they have! I have never seen such a unique and special necklace! So cool! Rachael lo_ts@ymail.com I love the Victorian feel to the prints! Ah I am in love with that pendant! So so pretty!! I love the look of the prints LDS produce, they are so beautiful! My hubby and I have a special place in our heart for some neat items that have symbolic significance to our relationship too! We're in it for good, FOR GOOD, so it's neat to keep those reminders of why we're together and what we've promised. I have a special keepsake box filled with all sorts of tangible things from different dinners/walks/events we've gone to together. I love that their pictures are different from the standard ones. You have my name and email! Good luck with your move, Cecilia!! I hope it all goes smoothly for you guys!! I've always loved looking at pictures of Churches, Temples, Synagogues, etc, are all such beautiful pieces of art. I believe so much goes into each of them and this is a wonderful company who is able to help showcase the Temples of your faith. Wonderful! their temple pictures look so classy. I have been wanting to get a picture of the Logan temple for the longest time! Me and my hubby were married in the Oquirrh mountain temple too!! I love the framed temple photos, I would love to win this!